"I am thinking of a short story thread - limited STRICTLY to working ships and their crew plus what goes on in ports they visit. I grew up from the age of two with old British tramps and very small ships (smaller than Lofoten) in the middle of the Pacific. There were some hairy tales about every one. Must be kept to about two A4 pages." That sounds different, fun, and related to our Captain's Voyage world, so here's the thread! Thank you, Mark. I have a considerable repertoire of ship stuff so will post some short pieces soon. An elegant Finnish vessel, toughened with armoured cladding and portholes 20 cm thick, rolls gracefully, sliding through beam seas rolling 45 degrees. Her green decks, black hull and cream superstructure plus a superbly sculptured funnel are meticulously maintained at all times. She crunches ice floes like cornflakes, spitting out the leftovers in her turbulent wake. She is slow, but gracious, but picks up speed with the courtesy of a following sea. He is neat, the only one to wear a uniform; he does not talk much, but smile and smokes almost continuously. Smile.. Time to try again. Go out to sea - good. Cigarette.. go west, to the Bismarck.... try again. Trying for the Lemaire. (If one entrance is totally blocked, the option is from the south. It is called the Kodachrome channel of the world). ....this freezer's gone bung. Huge crops of ice, piled one on top of another, great plains of brash ice stretch for miles under a leaden sky. Ice meringues sit solid, flashing crevasses of brilliant blue, rolling occasionally. The ship moves ahead, then stops. She tries again, the noise of the ice breaking can be heard throughout the ship, grinding, scraping, crashing. It all goes away when the Kapitan gives up, reverses out and this time, heads for the Bellinghausen Sea. Here are ice mountains, ice sculptures, ice bricks, moving as one great block of land, but there is open sea. We celebrate crossing the Circle with champagne and light snow drifting across the foredeck. The ship's horn sounds four times in the totally empty ocean. Nobody for miles in any direction. This time, the ship wins. Bruised and battered, she enters the Lemaire. Her pristine black bow is streaked with war wounds. Last edited by nari; December 29th, 2014, 05:04. Thanks Nari. Keep 'em coming - who needs photographs when you can paint word pictures like that? Who needs photographs?? Keep them going - yours look positively painted with the capture of the light variables. Maybe I will contribute here since I spent some time on Island trampers in just that area mentioned by Nari above in 1968 to 1970. Which island did you grow up on Nari? Maybe I have visited. home in halfway between Hawaii and Tahiti, and just above the equator, you'll find it, between Kirimati (where the Brits exploded their H-Bomb in 1957) and Teraina. Please contribute!!! Am looking forward to your posts. What ships were you with? Departure for Europe from our atoll. 1950s The vessel was owned by the Bank Line of London, who ceased trading in the 1960s due to the total loss of two ships, one on our island and the other in another 80 miles away. Their valuable cargoes of silver and other precious metals were not recoverable. Dusk falls rapidly on the Equator and the ship was briefly outlined against the western horizon, idling, keeping well clear of the reef. My father and I were in our launch, to accompany the last of the cargo boats and launches back through a 7 knot tidal passage to home. He and I leaped onto the gangway to make last contact with the Captain, with whom he had some loud exchanges that afternoon. I had hoped the Captain would offer some of his marvelous grapes (which we never had) but he didn't. This was the last port of call before Europe, where our cargo of copra was heading. I had heard part of the afternoon exchange where my father suggested to the Captain that the weather was not deteriorating at all, and he could come a bit closer. To which the Scotsman replied: My ship is more important than your cargo!! Which was quite true. Anyway, they shook hands and we departed the ship. It was now dark and the very obliging Laskars had hung hurricane lanterns over the gunwales to help us to see. They sang to us as they often did, fascinated by this tiny ring of land in the middle of nowhere. We moved around towards the bow and looked up. The ship was about 6000 tons and she looked gigantic. The horn blew four times, deafened us for seconds, then we stood up and yelled: BON VOYAGE ROTTERDAM!!! The ship uttered another blast, slowly headed off to the south and eventually east to Panama. There was no land in between to worry about. Just a slight risk of spontaneous combustion in the hold had we loaded unwittingly damp copra.......it had happened before. We went home and my father said, well that's that for three or four months. Last edited by nari; December 31st, 2014, 08:47. He was appointed to the Gilberts* every voyage, it seemed. shouting often over the noise of the roaring steam winches, with no answers. or on the hot decks probably cursing the day he joined the Company. he was there every time and always willing. He let everyone know his thoughts and his threats but he was always forgiven. 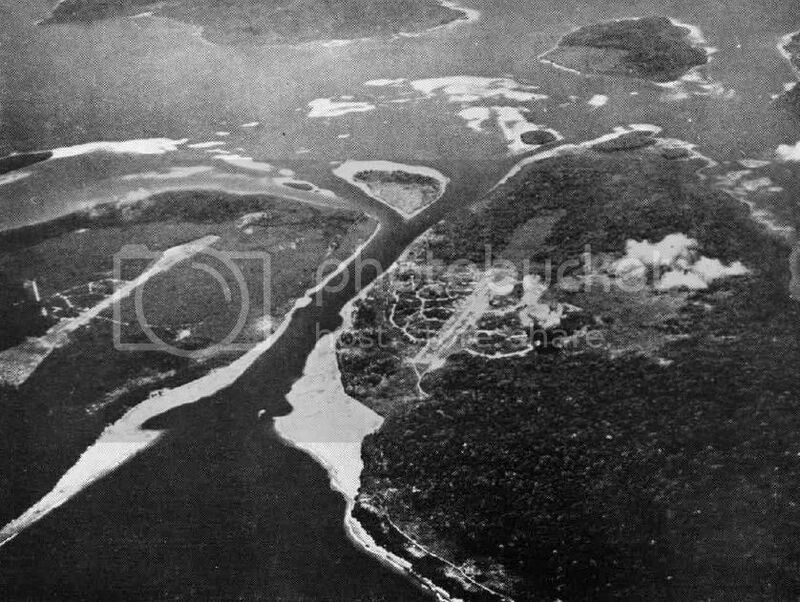 *Gilbert Islands, now called Kirbati. One of the most difficult places for ships - no wharves, just coral reefs and breaking surf. That could be me, only some 12 years later. Just navigated through your adventures at sea - two vessels ring bells for me: the Theben which I visited in Brisbane round about 1962, just for the heck of it, walked to the gangway and asked if I could have a look. No problem...very welcoming crew. The other is the Cherry Venture, which was a huge tourist attraction on Rainbow Beach for years as she began to rot in the sand. I have several photos of her -one in the early 1980s and another after she had semi-disintegrated, but they are very poor quality. In 1950 we were travelling on a little ship across the Pacific to Sydney. Around the western Pacific there are frequently cyclones in the summer months and the ship was edging around one that was forming near New Caledonia. The skipper was a well known character around the traps, Brett Hilder, son of an Australian watercolourist. Quite calmly he announced, twisting his long red whiskers,that we could not avoid it completely or we'd run aground on the reefs. The ship was wooden, the last of her kind, 600 tons. I remember watching in amazement as green seas way above the bow crashed down onto the deck and holds, racing nonstop to her stern. I was told it lasted abut 20 minutes - and I remember being quite disappointed when we finally outmanouvered the swells. Brett said calmly: "For a while, I thought she might dive, but she didn't. Isn't that thoughtful of her." She survived about 40 years of sailing. Nice memories from an area that was not very well charted in those days and weather forecast was not very reliable, if you got one at all. Reminds me of a scary situation in that same area but 20 years later. We had been hanging around Lord How Island for a couple of days waiting for the remnants of a Cyclone to pass to allow us to use surf boats to bring our cargo in on the beach due to heavy swell. 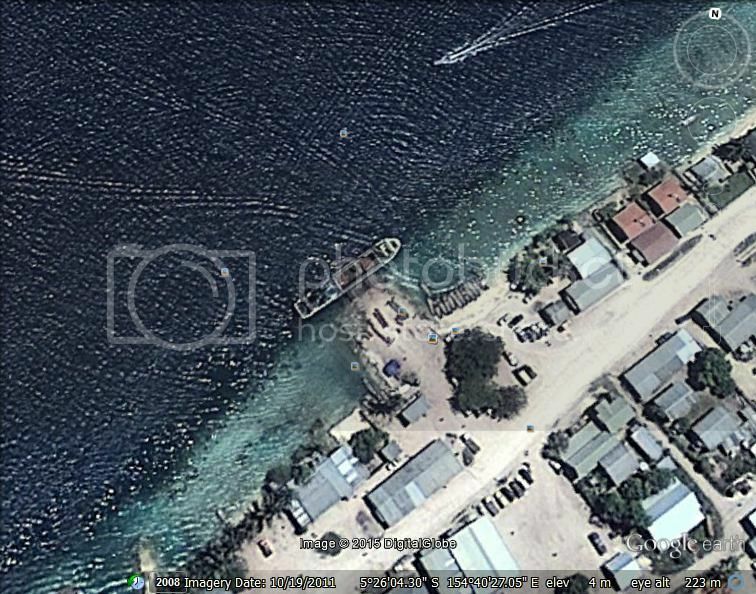 We eventually gave up and headed towards Samarai in PNG, at that time a thriving port, now abandoned. We sailed on dead reckoning, with no possibilities to get and sun or star observation during the day. After one and a half day without a fix, we approached an area of the Coral Sea with some major reefs, but we were supposed to pass well clear of them according to our estimate. During the night I was on watch with a Kanaka Quartermaster at the wheel and a Bukaboy on the wing as lookout, when I felt that the motion of the ship was changing. I went out on the wing to have a better look at what was around us. I could then hear the sound of breakers and suddenly saw breakers on our Port side and dead ahead. I rushed into the wheelhouse, pushed the Quartermaster away and turned the wheel hard starboard, away from the breakers I could see, hoping that there were open waters on that side. At the same time I screamed at the Bukaboy; "Call h'm Captain", while I got the ship on the reciprocal course to get away from the reef on the route were we had come from. Now, for those who don't know what a Bukaboy is; they are from a small island between Bougainvillea in PNG and Solomon Islands and are the blackest of black, not a shade of brown. Many with the white of their eyes red, as had this fellow. (More on the Buka and Buka Passage later). The Captain was new to the ship and to the Island trade. It was his fist trip with a Kanaka crew as well. He told me later it was the worst shock of his life when this big tall Bukaboy stormed into his cabin and screamed "Reef". All he could see was his white teeth and red eyes. We steamed South for an hour or two and then headed North again. The day dawned still cloudy and wet, no possibilities to get a star fix at dawn. We soon passed by the same reef on our Port side, but now clearly visible from miles away due to the heavy swell. This was on the Slidre Timur in 1970, so no GPS or other fancy aids to navigation and no working Radar, only ***tant, Chronometer, your senses and experience. The Owner had promised us a radar,"whenever they could find a good second hand one cheap". I have to correct myself on the position of Buka Island; it is off the northern tip of Bougainvillea Island, not the southern tip. It's been 45 years since I was trading in that area so memories fade, but some things and situations stick. 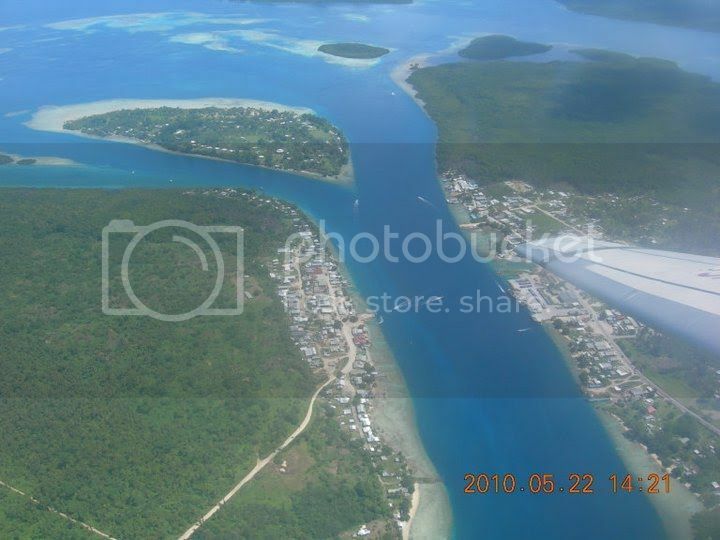 Speaking of Buka Island, Buka Passage is a narrow strait between Buka and the main Bougaineville Island. Buka Town and Kokapau across the strait on the main island is now thriving ports, with the main airport for the Autonomous Province of Bougainvillea is situated on Buka Island. In my days (1968-70) there were only a very short wharf with the face just barely sticking out passed the edge of the reef. Due to the clear water the reef could be clearly seen close to the shipside and at bow and stern when moored alongside. If port side alongside we would use the bow spring and engine to push the stern way from the reef until the bow got close to the reef edge, then go half astern to turn the ship into the channel. If Stbd. side alongside we used aft spring to lever the bow off the wharf slightly, then push the stern away by using hard rudder and engine dead slow ahead, until the current could take over. A very trick maneuver, since the propeller would get very close the the reef edge. Too strong current, the bow would turn too quick, to little and we needed more engine power for longer. One added complication was that the surface current and the under current didn't turn simultaneously. We could observe the surface current from whatever flotsam was in the water, but how to know when the undercurrent turned?? The solution was simple; drop a full and shiny Soda can overboard. It would sink more or less straight down near the surface, were there were no current, but suddenly "take off" when it got into the undercurrent. It could take a few cans of Canadian Club before the conditions were right. Sounds like an interesting place to operate ships?? 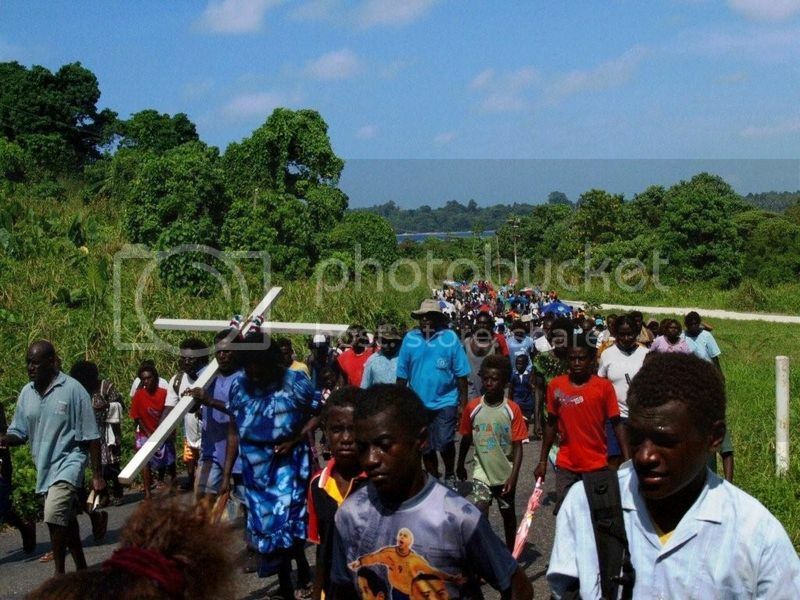 To illustrate I have looked downloaded some pictures from Buka Passage from the web. As can be seen here there have been a lot of development, incl. the port facilities. With a ship smaller in size than Slidre and Slidre Timur alongside. Definitely a lot smaller ship alongside. Doesn't look like much of port facilities does it?? Well, this is a lot more than we were used to on some of the island we served. 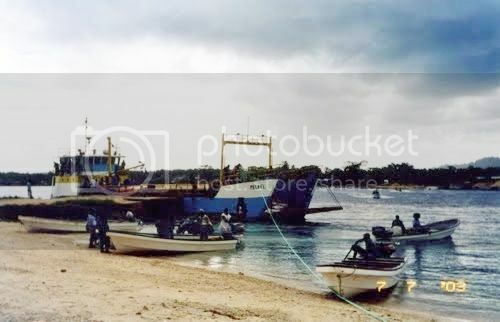 Some had no facilities at all, no port, or even sheltered bay/lagoon, only surf boats to bring cargo in and out. PS> Nari's father would know this place very well, I'm sure. Quite a story, or two, Ombugge. Yes, my father knew Buka well and Bougainville. His favourite town was Lae in PNG. You mentioned some ports had only surf boats to haul cargo out to the ship. That's all we had, and a narrow passage with a powerful rip through the entry point made life a bit exciting. Unfortunately the UK lost two 8,000 ton ships both on our island and the one north of us. After the second loss , they refused to service the islands. Can't blame them, especially as the price of copra was falling like a stone. Neither of the ships nor their cargoes of copper and another metal I can't remember could be salvaged - too deep and surf too rough. This was in the 1970s. The Bukas are certainly dark -wonder how they evolved. In fact there are several studies on this, which comes to similar conclusion. Some even claim that the Australian aboriginals and the Melanesians, who are not ethnically related, had evolved locally and are not of African stock. That may throw out the official version that humans evolved in Africa and spread around the planet from there, according to some. I had heard before that it is deemed quite possible that man did not evolve solely out of Africa; but the debate goes on. If one looks at the PNG indigenous and compare them with the Solomon islanders and Oz indigenous - there are distinct differences in appearance. Maybe it is epigenetics coming into play...I don't know. Rather like the difference between the Polynesians and Micronesians - the latter having a likely Asian origin. Very interesting stories, indeed. It is obvious that waves and swallows change near a reef or the coast, but it is difficult to imagine. Can you describe your feeling in such a situation? Is there less movement of the ship, a changed rolling or stomping? There is no simple way to explain this in words, except that when a ship is exposed to wave of a certain height, frequency and relative direction, it's roll and pitch motion has a "fixed" pattern. If any of the above criteria change the motion changes. On the Island Trampers we used this as a means of navigation. When approaching an island, or reef at night, we would be consciously wait to "feel" the change of motions, then turn around and steam back for a while to wait for daylight. On islands with no electricity (which was most) the first firm sign of life would be when the cooking fires were lite at first dawn. Once we felt the presents of the reef we would turn around. We would then approach at dawn, with all three Navigators on the bridge. The Captain would take star sight, while one officer would be standing by the Chronometer to read the exact time of each sight and the third would do the calculation and mark it out on the chart. As soon as we had two good crossing fixes we would correct the heading to head for the one opening in the reef that would give us safe passage to the inside fairway. We would continue shooting more stars to get as good position as possible. Approaching the reef there would several openings in the breakers, all looking the same, but only one was the right one. Once we had entered the reef, with the sun now above horizon and on our stern, we could clearly see the reefs and steer clear of any shallows, until we reach the inside fairway, leading south to our first port of call, which could be Cairns, Townsville, Rockhampton, or even Brisbane. There were a wider and well marked passage further south, at Cape Flattery and at Lizzards Island, but that would leave us exposed to heavy weather longer. Last edited by ombugge; February 24th, 2015, 14:46. A great account of the very precise hazards of navigating past/through and hopefully not over the Reef.